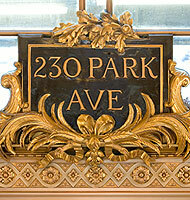 The firm's offices are centrally located at 230 Park Avenue, just two blocks north of Grand Central Station. The historic, Beaux Arts building was conceived and built by the architects Whitney Warren and Charles Wetmore, who also designed Grand Central. Originally headquarters for the New York Central Railroad Co., 230 Park has retained its classical elegance and ornate style, and is one of New York City’s most photographed office towers. The floors occupied by the firm formerly served as the railroad’s executive offices. We invite our clients, prospective clients and friends to visit. © 2005 - 2019 Otterbourg P.C.